You must make reservations at least 5 minutes in advance of the time at Duke's Seafood & Chowder - Green Lake. Parking is available behind the restaurant and on the street. 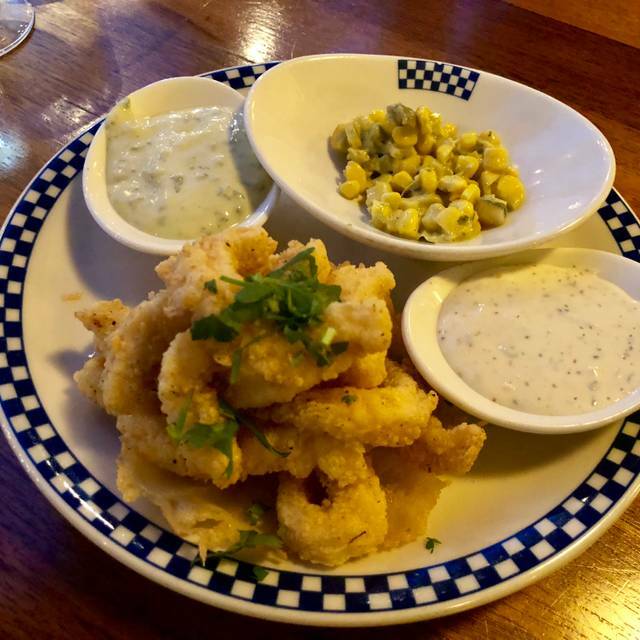 Duke's is an upscale casual Pacific NW seafood concept offering signature, flavorful, 100% sustainable wild seafood, Award Winning Chowder and grass fed burgers in a gathering place that is friendly, comfortable, unpretentious and filled with personality. We only source all natural, healthful ingredients. Duke's food is free of hormones, antibiotics and free of harmful chemicals. Guests sum up their favorable assessment of what Dukes Chowder House has to offer with three words: It’s so good! Tillamook Extra sharp white cheddar, fresh baked bun from Essential Baking Co.
Virgin beverages to cool down, warm up or just sip to enjoy. Pure cane and natural sugar sweetened. No high fructose corn syrup ever! Hendrick's Botanical Gin with Giffard Wild Elderflower liqueur, homemade sour and fresh basil, vigorously shaken and served "up"
Ketel One Citroen Vodka - DukeWorthy pour, vigorously shaken and served "up" with a lemon twist. No Vermouth Ever!! Cheers to the Best Selling Premium Champagne in the World! Arguably the top Viognier in Washington, this luxurious medium-bodied white boasts ripe citrus while staying pure, clean and focused through the finish. Mark Ryan Winery named one of Wine & Spirits Top 100 Wineries in the World for the 3rd year in a row! Always has the best seafood in town and at the best locations. Also the sour dough rolls are amazing. We met our kids and grandkids here for dinner. Our table was all set up when we arrived, complete with highchair. Our waitperson was so friend,y and attentive to our needs, anticipating what we would need for the 1 and the 4-year-old kids. Our food was fantastic, as always. 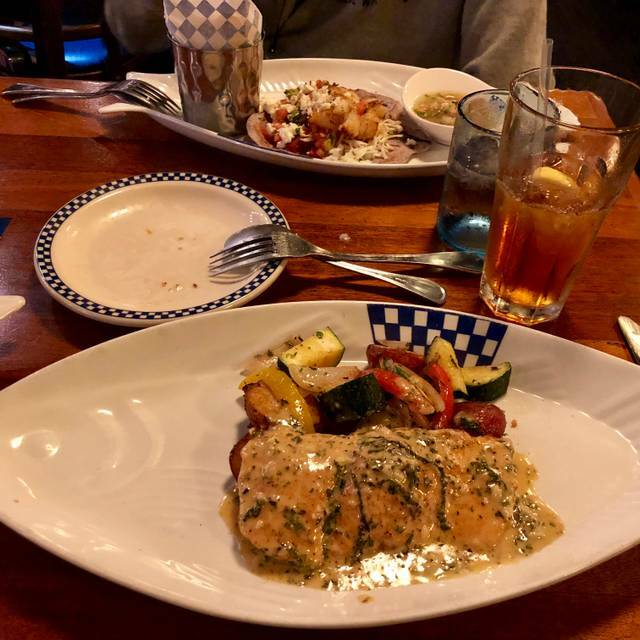 We love coming here because we know we can count on a delicious meal, full of wonderful flavor. A great neighborhood spot with excellent cocktails and quality fish. Overpriced for the quality. Fish and chips were beyond dry. My husband and I went to duke's for dinner using my birthday coupon. We love Duke's and we had a wonderful time! The food was excellent and so was the service! Duke's is our family favorite for celebrating special occasions. The food was delicious (best chowder ever) and the service was first-rate. My only complaint is the disappearance of the cole slaw! Duke's had wonderful slaw, with a light sesame dressing. It went missing several years ago, replaced by a lackluster Waldorf salad or an OK kale salad. Please, BRING BACK THE COLE SLAW!! Great experience for connecting with friends and colleagues. Great for a leisurely lunch. This was my first experience of Duke's. Everything was excellent and Duke's is definitely on my list for special occasions. I will have their house recipe grapefruit cocktail next time! You can't beat the quality of the food and service here. Serious yum happening at Duke's! It's a little expensive for what you get, so we tend to go here with out-of-town guests and special occasions...with even a 10-15% reduction in prices, we would go more often. I love my neighborhood Duke's. Being a vegetarian that does not eat seafood, I wish Duke's would offer more vegetarian options on the Happy Hour menu and the lunch and dinner menus. Rachel was our wait person as well as the bartender for the bar area. She had everyone under control - regulars and newbies - and she was quite entertaining. She knew her menu and had some great recommendations. We would return for her personality alone! We had the most delightful meal at Dukes with Jaime as our server. My salmon and vegetable dish was served with perfection including quick fried basil leaves on top. 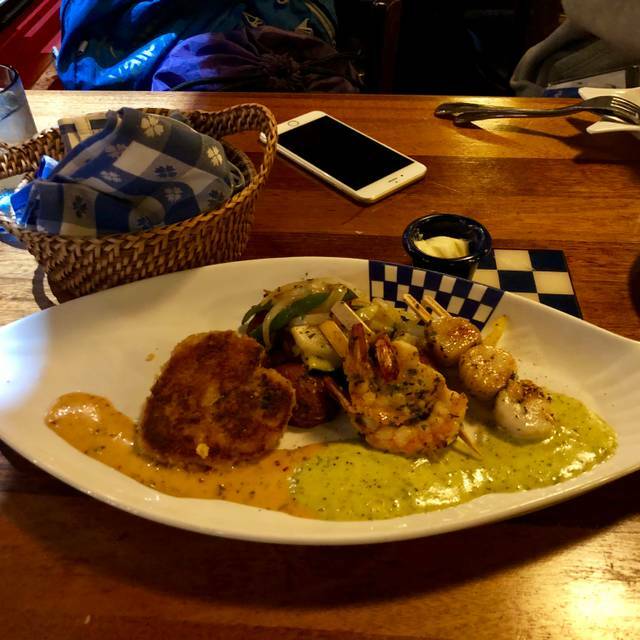 My wife’s dish was a delightful mixture of crab cakes, scallops and shrimp. All in all, a delicious, wonderful evening. 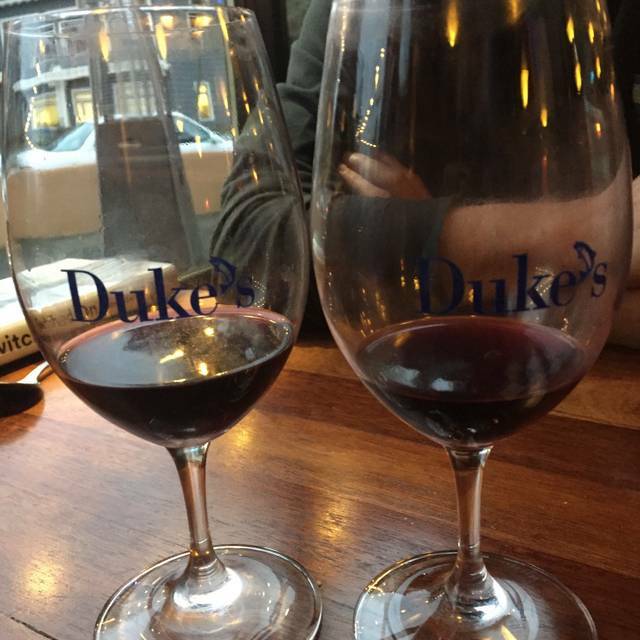 We’re from out-of-town and every time we visit our son in Seattle we dine at Duke’s. Consistently good food. The chowder won the night. We had both the traditional and lobster chowders, and they were great. Otherwise, a solid seafood meal that you pay handsomely for, more to have the comfort that it’s sustainably raised than to have a taste experience that is unique. Totally solid meal. My wife and I had our date night at Dukes’s on Greenlake and had a wonderful time. Online reservations. Great waiter. Awesome food at a fair price. Our food was cooked perfectly and our waiter, Jamie, was the best. I would request one of his tables for any return visits. My conclusion at the end our dining experience was that we need to come to Duke's more often. Great food, a little pricey, but with it. We have dined at Duke’s on the patio in good weather, but never inside. It was pleasant and a cozy atmosphere to be inside on a wintry Valentine’s Day. The food was very good, our waitress excellent. Overall a wonderful evening. Great place to eat! Get the clam chowder it’s the BEST! The food is very ordinary. Caesar salad was very bland and salmon overcooked and overpriced. $200 for 3 people and only 2 glasses of wine. Sevice was excellent. Decent food with great service. It’s pricey for what it is but normal for Seattle’s food scene. We have never been disappointed with the cuisine - served hot, quickly and delicious each time. Service is also consistently great - made to feel well attended to and always efficient. Wonder why we keep going back?! We love Duke’s. Wonderful chowder, salads, sauces,and Bloody Mary’s. We always visit Duke’s when seeing family in Seattle. This is the place we go when we want the highest quality food, great service and no disappointments. If you don't believe me about the quality of the food prepared at Duke's, pick up a copy of their "As Wild as it Gets" Cookbook and see for yourself! I have had 2 great experiences at Duke's, one for happy hour burger on the deck last summer and one more recently for dinner. Both were great. The burgers are scrumptious and my crab-stuffed blackened cob was a taste delight. I consider us regulars at Duke's, we know a good portion of the menu by heart, and definitely the entirety of the dessert menu. 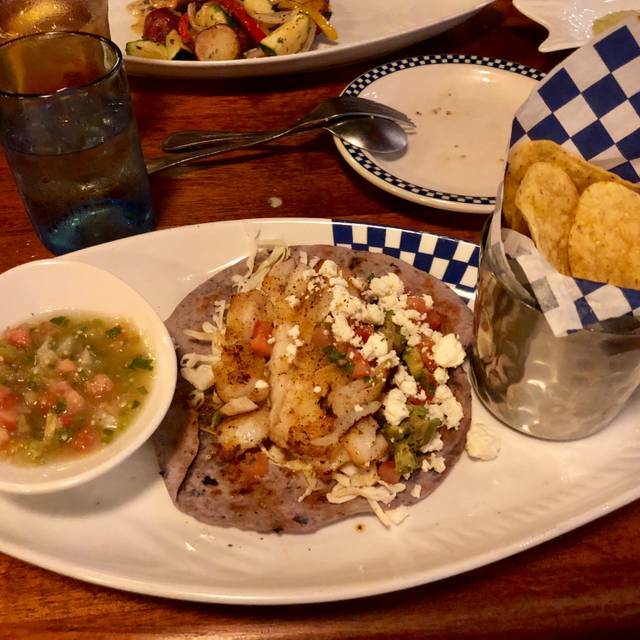 My favorites include all the chowders (especially the NxNW), the fish tacos, fish and chips, and the Prawns Del Cabo Wabo. Service is steadily in the 4-5 star range. The best anecdote is the time when my waiter remembered the drink I liked the time before even though I myself coult not remember exactly. Most recently, we went on a night when Duke's had a musician perform holiday-themed blues/jazz music--it was a fantactic way of feeding our anticipation of the year-end holidays! Great place for seafood and chowder!!!! We've been coming to Duke's for years and it never fails to satisfy and always makes you want to go right back! Chowder was hot and tasty. We ordered mussels for an appetizer, but they were delivered after our main course... still, they were prepared well. The location was perfect for us . I think I would return in the summer for outdoor seating.. Always good food - nice neighborhood treasure! Our waiter was super nice. The food was awesome. Great atmosphere. We were able to walk from there to the Bath House Theatre. All in all a great evening. The restaurant itself was fine, but the waiter was responsible for way too many tables/people to be able to provide adequate service. Consistently great fish and chips burgers salmon halibut chowders with great wine and beer. Servers are fast and friendly. Service was great! Thanks Jamie!